When you think of Hawaii, you think of white sand beaches, surfing, hula girls, and a luau. But the best part of any show is the fire knife dancers (as seen in this youtube video). And no one knows fire knife dancing better than the Polynesian Cultural Center. At their evening production of Ha Breath of Life, the PCC pulls out all the stops with world class dancers (including Tahitian dancers who are often a bigger crowd pleaser than the hula), music, and fire knife dancers (!!!). 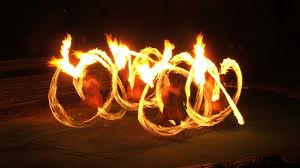 These men are daring as they sit on a bonfire wearing long grass skirts, twirl double ended fire batons, balance the fire on their feet, swallow it, and "play tricks" on the other dancers. Highly entertaining pyrotechnics that will leave you gasping and wishing for more. And for a 2 day engagement, you don't have to go to Hawaii to see the show. It is coming to Utah at the West Valley Cultural Celebration Center. And tickets are only $10 (far cheaper than the Hawaiian price). Many of these dancers are students at BYU Hawaii and are trained and costumed better than anywhere else in the world. My only complaint is the plot only exists as a segue between dance numbers (though some audience members may appreciate a storyline rather than a dancing variety show). Frankly, fewer dance numbers and double the fire knife exhibition would be perfect (but probably overly taxing on the fire dancers). Regardless, the fire knife dancers are worth the ticket price alone. That would make for quite the spectacle at any olongapo dance club. The risk of burning down the house though should not be overlooked.